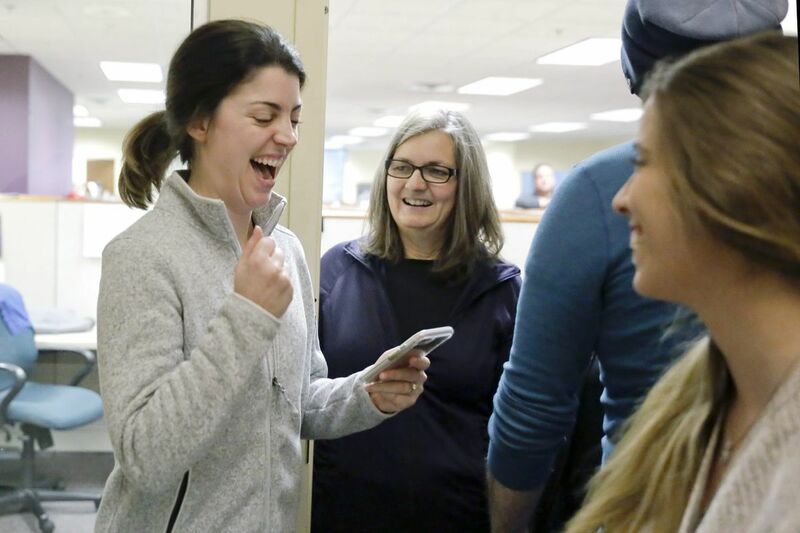 Sarah Bowling reacts after she correctly answered a question while playing HQ Trivia with coworkers Beth Matteson (middle) and Charlotte Gaines (far right) at Artcraft Promotional Concepts in Moorestown on Dec. 29, 2017. Every day at 3 p.m., coworkers huddle in art director Larry Giuffra’s office and play HQ Trivia. Larry Giuffra raced back to his Moorestown office Thursday after a midafternoon lunch — he had an important 3 p.m. meeting with coworkers — weaving through traffic to get back with just a minute to spare. But the meeting wasn't about his work as art director at Artcraft Promotional Concepts. It was to huddle with coworkers in his office to play HQ Trivia, an app that's become America's latest digital obsession. The app is like the smartphone-based version of Who Wants to Be a Millionaire?, and hundreds of thousands of people log on every day, at 3 and 9 p.m. sharp, to take part. That's because there's free money at stake. "It's a riot how much this is controlling people," said Giuffra, 28, of Voorhees. "People get so addicted to it because it's a simple mind break during the day that they come together and try to win." Once a user is logged in, he or she will see comedian Scott Rogowsky, the host of HQ Trivia, who's typically wearing a suit and standing in front of a colorful background of swirling dots. Rogowsky has become a cult figure whom fans call "Quiz Daddy," and users love or hate his freewheeling tone and cheesy jokes. Rogowsky will navigate the hundreds of thousands of players through a series of 12 multiple-choice trivia questions that start out easy — "Which of these is a real U.S. state?" — and increase in difficulty — "Which of these is not a character in My Little Pony: Friendship is Magic?" Users have just 10 seconds to answer, which means cheating by way of Google is nearly impossible. Left: A screenshot of HQ Trivia host Scott Rogowsky. Right: One of the easier trivia questions on HQ Trivia. One wrong answer knocks you out. Players who answer every question correctly split a pot of money that's typically around $1,500 but that has been as high as $12,000. That means the more people who win, the smaller the prize (which is administered to winners via PayPal). Sometimes, more than a hundred players win $11 each. On Christmas Eve, two winners made $6,000 apiece. For now, the game is financed entirely by investors, and it's ad-free. But there's talk from those behind the app that an advertising model of some sort is coming, with the goal of eventually hosting a game with a $1 million jackpot. Jim Stout, a retail merchandiser from Swarthmore, said he's played HQ Trivia several times a week for the last three weeks or so. For him, it's not about the cash. "It's just the competitive nature of seeing if I can get 12 questions right," Stout, 35, said. "Just the principle. At this point, I need to beat it." The app launched in August and had grown to about 3,000 players by mid-October. On Thursday afternoon, 562,000 people played. Some say HQ represents the future of interactive gaming, live streaming, and broadcast quiz shows all rolled into one. Like Family Feud or Jeopardy!, HQ has served as a connecting point for families, groups of friends, and coworkers who band together to beat the game. "Everyone gets so excited," said Giuffra, who's played with family as well as coworkers. "It's all loud and giggly, and it brings the office closer, even if it's just for that 10 minutes of the game." But HQ, like many other digital fads before it, has faced criticism. Some users complain the app is plagued with glitches, whether it's a lag in the live stream or a spotty connection. Sixer Justin Anderson apparently struggled with this. There are also the rolling and trolling comments at the bottom of the screen, which are filled with everything from Star Wars: The Last Jedi spoilers to political proclamations ("TRUMP TRUMP TRUMP" is a common one) to anti-Semitic comments directed at Rogowsky, who is Jewish. The app's CEO and cofounder, Rus Yusupov, was publicly humiliated after he unloaded on a Daily Beast reporter who was trying to write a profile of Rogowsky. In November, Yusupov threatened to fire Rogowsky simply for speaking to the media, then launched into a lengthy tirade in which he told the reporter she couldn't include a line about Rogowsky's going to salad chain Sweetgreen because "We do not have a brand deal with Sweetgreen!" Yusupov, who also created the six-second video app Vine with HQ cofounder Colin Kroll, apologized "for being a jerk" and offered to take the reporter to lunch … at Sweetgreen. Public relations blunders aside, the app has continued to attract a fan base. Brenna Horan, 23, an actuarial analyst who lives in the city's Rittenhouse section, has played the game for two months and said she felt like it was a learning opportunity. For example, she recently learned through answering a question incorrectly that the plural of "octopus" is in fact "octopuses," not "octopi." But Horan, who's just out of college and saving up for a wedding acknowledges it's the cash that keeps her coming back. "All you have to do is answer questions," she said. "You could walk away with like 40 bucks that you didn't have before."